Proposed legislation would rename NASA’s Dryden Flight Research Center, seen here, after the late astronaut Neil Armstrong. An effort to rename a NASA flight research center after the late moonwalker Neil Armstrong was relaunched this week in Congress. Congressmen Howard "Buck" McKeon (R-CA) and Kevin McCarthy (R-CA), the majority whip of the U.S. House of Representatives, announced legislation on Thursday (Nov. 29) to redesignate NASA's Dryden Flight Research Center as the Neil A. Armstrong Flight Research Center. The bill would also rename the Western Aeronautical Test Range as the Hugh L. Dryden Aeronautical Test Range. Similar legislation to retitle the southern California facility was introduced in July 2007 by Rep. Ken Calvert (R-CA), who is co-sponsoring the new bill. McKeon and McCarthy supported the prior attempt to rename the center, which is located at Edwards Air Force Base in California's Mojave Desert. Armstrong, who in July 1969 became the first man to walk on the moon, died earlier this year following complications resulting from cardiovascular procedures. "I am proud to be an original co-sponsor of this bill renaming the NASA Dryden Flight Research Center in honor of Neil A. Armstrong," McKeon added. "Dedicating this stellar institution to Neil Armstrong is a small token of our public gratitude and will hopefully work to ensure that his legacy is honored for generations to come." Dryden Flight Research Center is NASA's primary center for atmospheric flight research and operations. In addition to its research work to advance the design of civilian and military aircraft, Dryden was the primary alternate landing site for the space shuttle and is now managing the launch abort systems testing and integration for NASA's Orion crew module, its next-generation multi-purpose spacecraft. Dryden was originally known as the Muroc Flight Test Unit under the National Advisory Committee for Aeronautics (NACA), the predecessor to NASA. The facility was also referred to as the High-Speed Flight Research Station and High-Speed Flight Station before becoming a part of the nation's space program with NASA's founding in 1958. On March 26, 1976, the flight research center was named in honor of Hugh L. Dryden, the former director of NACA, who served as NASA's first deputy administrator up until his death in 1965. One of the country's most prominent aeronautical engineers, Dryden helped shape policy that led to the development of the nation's high-speed research program and its record-setting X-15 rocketplane. He also headed the negotiations for the early agreements with the Soviet Union on the peaceful use of space. The proposed legislation, if approved by both houses of Congress and signed into law by the President, would still honor Dryden. "This bill also continues to recognize Hugh Dryden by renaming the center's test range in his honor," McCarthy said. According to McCarthy, the decision to honor Armstrong was based in part on the astronaut's history working at the flight research center. "This bill recognizes the achievements of Neil Armstrong in aerospace travel and space exploration, and highlights his important connection to Kern County," McCarthy said. "He was a great American who served as a test pilot and began training for his famous astronaut career here in Eastern Kern. Later, he oversaw aeronautical research programs at the center and spearheaded technological innovation that continues to this day." 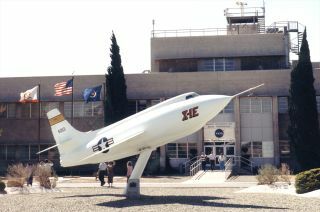 The bid to rename the flight research center and its test range has the support of members of the area's aerospace industry and local community organizations, including the Antelope Valley Board of Trade, the Mojave Chamber of Commerce, the Palmdale Chamber of Commerce, and the Edwards Air Force Base Civilian-Military Support Group. "It is most appropriate that astronaut Neil A. Armstrong be honored and memorialized in this way with his noted lifelong accomplishments as the first human to walk on the moon and as a former test pilot who worked at the Dryden Flight Research Center," Stuart Witt, CEO of the Mojave Air and Space Port, said. Should the bill pass into law, it wouldn't be the first time a NASA center has been renamed for an astronaut. On March 1, 1999, Lewis Research Center in Cleveland, Ohio — which was named after Dryden's predecessor at NACA, George Lewis — became the NASA John H. Glenn Research Center at Lewis Field for the first U.S. astronaut to orbit the Earth.